I have a home network with three computers (two desktops connected with ethernet cables to a Linksys router; laptop is wireless). The wireless signal is encrypted and I gave my next-door neighbors my network key so they can wirelessly connect just to check email, do banking, etc. They are not on my home network, but can they still see where I am surfing (such as my bank site with passcodes, etc.)? If you give someone access to your wireless access point, you have given them access to your home network. I hope you trust them. It’s important to realize that a wireless connection – regardless of how your hardware is set up – is a connection to your network. 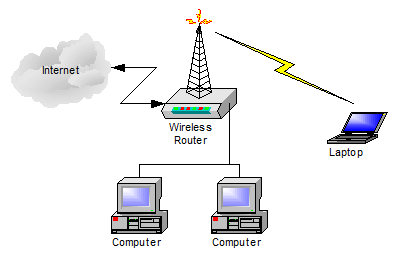 That’s a simple setup where multiple computers are connected to the internet via a single device: a wireless router. Some computers are wired, and some computers are connected via the wireless connection. A wireless router just puts the wireless access point in the same box as the router itself, but in either case it’s nothing more than a connection to your local network. And of course machines on your local network should all be able to “see” each other. It’s good that your wireless access point is using encryption, but it’s important to realize what it does and does not do. By giving your neighbor the password you’ve given them the encryption password. As a result, the encryption is not affecting your security with respect to them at all. It’s as if they were connected directly to your network – because they are. It’s almost the same thing as having given them a wired connection to your router. The encryption prevent others – people to whom you have not given the password – from accessing your network. leo notenboom wifi security, wireless secruity. permalink. I’m impressed, I need to say. Really not often do I encounter a blog that’s both educative and entertaining, and let me let you know, you might have hit the nail on the head. Your thought is excellent; the difficulty is something that not enough people are speaking intelligently about. I am very happy that I stumbled across this in my search for something regarding this. When I’m on the internet Facebook for example, I can hear mr next door neighbours reaction to the the things I wrote even before I post (the walls are are thin in my apartments and we can hear each other) they must have hacked my phone it’s an iPhone , how do I stop this ? Do you have a security solution installed? If not, we would advise getting one and running a scan to see if anything can be found. You may also contact Apple directly and see if they have any suggestions. I let my neighbors use my internet for Two weeks for their kid to do homework. But that was a mistake, someone in that apartment got into my Spotify and saved a bunch of rap songs I would never in my life listen to (I’m a metal Head) my husband asked them about it they denied it of course but I changed my password and reset my router right away. I do a lot of online purchasing and wasn’t about to have them get into any accounts with cards on them. That was yesterday and the kid came and asked to use it again for homework… In told her no because someone accessed my account. I do feel bad but there is a library five minuets from here. Leo's answer is completely useless. He didn't answer the question. I have Windows 7 on a laptop, and use Windstream for my Wi-Fi.My boyfriend Kevin(who is blind),and I live in an apartment next door to his ungrateful, lying-thieving son and(same type)girlfriend. Kevin has given the Wi-Fi password to them AND their neighbor, whom we barely know. We have had problems ad-nauseum with the speed and performance of the computer ever since this piggybacking. We have also gotten virus attacks so severe I had to re-build the OS twice. I have to get them off; how do I explain the dangers Kevin so he doesn’t think I’m being spiteful to his son? Agree with Delton Baker, the author did not discuss 1 danger of allowing neighbors access. Might want to change the post title or elaborate on what exactly the risks are with someone having direct access to the network. I was looking for an article to share with a neighbor who constantly asks if they can “hop” on for a bit. This article does not help with that at all and does not explain, for those considering sharing their wifi, what the real risks are. You guys are paranoid. Are You doing something illegal? Are You still being charged per megabyte? Why do You feel the need to be so “private” anyway? -Are you holding sensitive information that is a matter of national security? did you do something so wrong that nobody can ever know? @Nate: YIKES, where do you start! When one has a connection to your wireless network, they may have access to your shares, drives and maybe your printers, They would also be able to watch your traffic. Paranoid huh? Please leave your SSN and credit card numbers in your reply, you can trust the internet. @Nate: What about the risk of people accessing your personal information, like bank accounts, etc. Did you ever consider that outsiders on your unsecured network may be doing something illegal? When my Son is visiting, he is on my wireless connection….can you Please tell me if he is not in my home, how far away can he still use my signal (or can he) ? I think that I know the answer to sharing wi-fi without risk. I have an old linksys wrt54g wireless router that I have converted into a Repeater via a download of a modified version of the router system software. It is located by my tv in the livingroom and set to repeat from my Netopia 2247NWG-VGX wireless modem with internal router. I have my tv connected to one of the nic jacks in the rear of the repeater, via a nic cable, by way of my blue-ray disc player. This allows the downloading of movies from netflix from the internet and allows my wife to use the internet access to play music from the internet also. My Netopia is secured by encription and password to prevent unauthorized access to the netopia, and the repeatet is also connected to the Netopia via the same security. The output of the wireless repeater is left unsecured. Computers homed on the netopia can network between themselves all that they please, but no networking can happen between the users connected to the Netopia and the ones connected to the Repeater. This is because it would be the same as trying to set up a connection through two routers connected back to back, which cannot happen. Did you ever see anyone try to connect a wireless routher directly to a dsl modem that already had an internal router without turning the router off in the modem? It don't work! Two routers back to back! I am always helping a friend or neighbor out with their computer problems and don't lke to have to put in a security code or password to connect them while working on their computer at my house. And I still have security from hackers passing through. @Hugh Rountree: Please be aware that your Lynksys repeater is an authorized “user” on your encrypted network. Anything and everything connected to your Lynksys is simply passing through that authorized connection. By configuring it as a repeater, or network hub, you are simply adding additional network ports, nothing more. You have disabled the firewall features of the router. @Hugh Rountree: ” Did you ever see anyone try to connect a wireless routher directly to a dsl modem that already had an internal router without turning the router off in the modem? It don’t work!” – Sorry, it actually does work. That’s exactly how my wireless is setup: An ADSL modem/router (in router mode) connects to my ISP and feeds a wireless router which distributes to my network. In this way the ADSL modem/router does the automatic dialing to the ISP on startup; if it were in bridge mode (routing turned off) I would have to use a software ISP dialer for the modem to connect, or turn the connecting over to the wireless router. In your setup, which is inverted (the wireless router is the one directly connected to the ISP) it may work differently. Well I hate to pee on anyone’s parade… but the first concern that comes to my mind is “THEFT OF SERVICE”. Most ISP agreements that I have read are limited to YOUR physical home address… rite down to your apartment number. Your neighbours are supposed to buy their own service. @BB: Besides that, you should be concerned about the fact that if anyone using your WiFi network does something classed as illegal (even though unintentionally) the IP address that can be identified by police will be your router’s, and that you’ll be held as co-responsible. Thus, in effect you’re not only trusting your neighbours, but anyone else that can hack into or use their computers. It just stands to reason that the more people you put onto your wireless network, the slower it will be. We have six computers in my home. One of those computers is wired directly into the internet router. The other five are wireless laptops. We have several tablets and a netbook, plus smartphones in use, as well. Each of those can access our wireless network. When Comcast chooses to do so, they steal bandwidth from our network which slows our connection even further. I cannot afford to be more bogged down by sharing my internet connection with my piggybacking neighbors. I to was hoping for something more insightful. I guess he got me to follow his dramatic "Head Line". I will have to be more careful in the future. WPA2 encryption, which should be available on almost any wireless router sold in the last six years, is much more secure than WEP (see http://en.wikipedia.org/wiki/Wired_Equivalent_Privacy) and no harder to use, except for the need to provide a decent password (see http://en.wikipedia.org/wiki/Wi-Fi_Protected_Access#Security). I had a friend that connected to his neighbors unprotected network. He could see their entire c drive. That was was windows XP. The bottom line is, If You can't trust them don't give them the info. David Decker have a good point. More can be explained here. P.S. Sorry for my english, I talk french ^.^. Actually, any device on your wireless network can see everything that leaves or enters your computer. With free software, they can capture every piece of data that goes over that network. They will see every site and everything you download from the internet. As to whether they can get information like passwords for online banking, not very likely, most banking sites set up an SSL connection before you log into the site which helps protect your login transaction and everything that happens after that until you tear down the connection. More can be explained here. Are folders or files being shared? What about guest access which is available on routers now? Actually on Windows 8, the only thing that shows up is my public area with only one folder available. I have a wireless network at home and an additional wired computer on the network and I have to jump through hoops to share other folders with my other computers. I don't know about Windows 7, but I think I had the same problem there. I think the hype in this article is overblown, especially for Windows 8. Unrelated to the kind of operatingsystem you got at home, one can easaly see what you are surfing and see some passwords on your emailaccounts etc. if you give your wifi key to someone. does that mean it is accessible to driveby hackers or local neighbours? Or does the fact I have a password, (even though I dont need it to connect)protect me? Even if your SSID is not visible when a computer scans for wireless networks, the network will still show up, it just won’t have an SSID listed. If someone wants to get your SSID they just need to capture traffic until a device connects to your access point to get your SSID. If you don’t need a password to connect to your wireless network, it is not secure and can be used by anyone. Not only that, they don’t even have to get on your network to see your traffic because it is being broadcast in the open. I’m glad I read your article. I am now a bit concerned that one of my friends across the street knows my WEP number on my router. He also knows my password for my computer. From your article he probably can and have seen my computer data. Is there anyway I can allow to use my WEP while preventing him from seeing my computer and where I surf? Would I be able to protect my privacy by just changing my password? First, don’t every use WEP to secure your wireless network. It is no longer secure and it only takes a hacker about 2 minutes to crack WEP and get on your network. WPA2 is the best bet and when setting up WPA2 you should use AES encryption if possible. If AES is not supported by either your router or other equipment then you should choose TKIP. Both are secure but AES is more secure than TKIP. Next, it doesn’t matter how secure your network is, if you give someone the key they have access to anything sent over your network. (Surfing history, emails (if not encrypted), etc). It is just like putting the best deadbolts on the doors to your house and then giving the key to your neighbor. They can come into your house anytime and take what they like. Sharing wireless is an invitation to identity theft. Remember the golden rule: Good fences make good neighbors. As a general rule I use WPA2 and 16 or more character encryption key and log into the router from time to time to see if there is any device I don’t recognize using my network.